4.6 (Based on 17 Reviews) 94% of reviewers recommended this product. I'm a beginner but there is definitely a bid difference between the stock eyepiece and this one. Yes, this is a super wide angle and the stock was not. The clarity is much better and eye relief is much better. You can also tell by the weight of the eyepiece. Very happy with this purchase. Was looking for a eyepiece with similar magnification and saw that this was one of the only ones in stock and at a decent price for someone who just started. Used it and enjoyed the view. My 10 mm Agena eyepiece is an excellent eyepiece and very reasonably priced. 2x Barlow in my 8 in. Celestron Go-To scope. I was surprised by the build quality of this piece based on a similar purchase in the price range for a GSO plossl. This piece was far heavier, but only in the sense it feels sturdy. The optics had a better coating than my GSO blocking more reflections and displaying a nice purple tint. The field of view is excellent for this magnification through a 60/700mm refractor. Keep in mind that this high magnification brings 'poor seeing' into higher effect. Luckily my first light through it was crystal. Review by franklymls of Baltimore, MD. No eye relief, difficult to get focused even in my F/10 6" scope, difficult to scan field. I've seen through the other pieces in this line and didn't have the same challenges. Review by SYZYGY of CT.
Nice optics at a great price. Several companies sell these same EP's under different names, with slight price variations. The FOV is nice and I have had worse for the same price. These EP's are money well spent for the budget concious, recreational astronomical observer. This is actually my 2nd purchase of this wonderful eyepiece. My first 10mm SWA was for high power wide angle viewing with my 8" SCT, primarily planetary viewing. I was blown away by the performance of Agena's 10mm SWA. 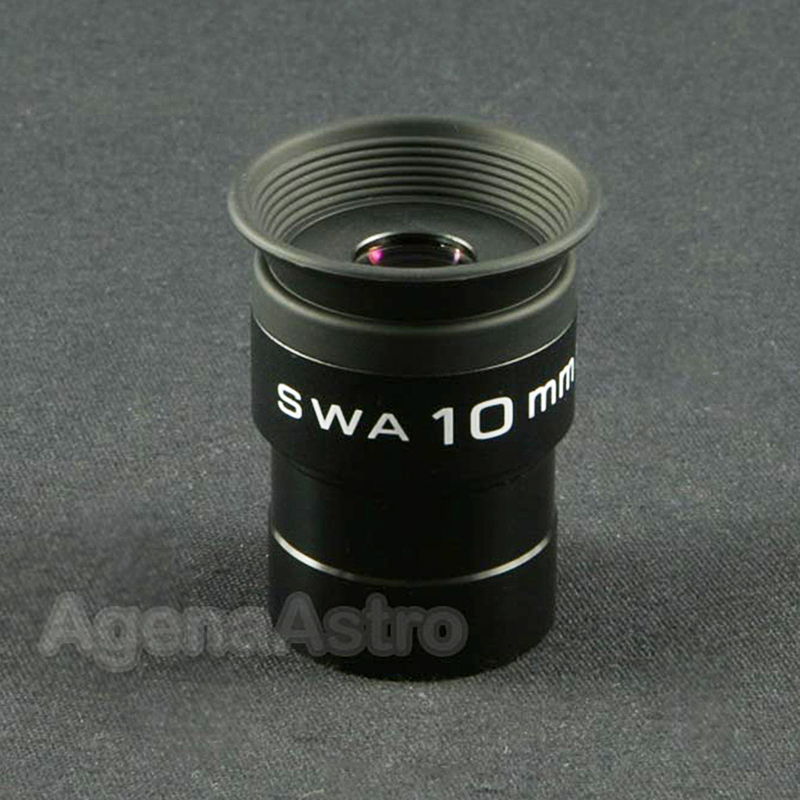 I had several high end high power eyepieces that I ended up selling, prefering the Agena 10mm SWA. I then bought a WO binoviewer and a match for my 10mm SWA. I thought it was good before but now all I can say is WOW!!! This pair of 10mm SWA eyepieces give incredibly stunning planetary views with my binoviewer in my 8" SCT. I also have a very fast short tube refractor piggybacked on top of my SCT and the 10mm SWA works very well in this scope as well. It gives medium power wide angle views with pinpoint stars to the edge on the little refractor. Having invested much time and many dollars in this hobby, I find the Agena SWA eyepieces to be one of the best values, best performers at anywhere near the price. You just can't beat it. I wanted to try this out on all my scopes before I wrote a review. ETX60: Great view of the moon no false color added. SLT130: Worked well on Jupiter; the outer moon was close to the edge and slightly soft. 12XXi: With this fast scope, the outer 5-10% is soft. Still gave a nice view of Jupiter and M42. I prefer this eyepiece over a 10mm plossl for the better eye relief and almost as sharp views. Excellent on-axis sharpness. Great for high power applications with a small price. Better to save money and get this for higher power and spend the big bucks on a low power Panoptic where sharper edges are more in demand. My primary scope is an 8"SCT at f/10. I own a Baader 9mm ortho, a TMB 9mm planetary, and a Televue 8mm plossl, but the Agena SWA 10mm is now my preferred eyepiece for planetary and DSO viewing. Great for splitting binary stars. Better control for light scatter. It does it all. I'm selling the Baader, TMB, and Televue and buying the 15mm and 20mm Agena SWA. This performance is up there with the big boys. This eyepiece rocks! With the 70 degree field it makes looking at pretty much anything, except open clusters, a breeze! I love it and the views. Looking at Saturn and Jupiter really give you the feel of looking at them through outer space. I would refer it to anyone looking for a good set of eyepieces! A super eyepiece that gives you a little power and a great, widefield view! Excellent for detail of Saturn and Jupiter while allowing enough FOV for observing their moons as well! Superior coatings, sharp contrast, crisp images edge to edge. Highly recommended! Review by StarCrewser of Granite City, Illinois. 5.0 Item does what it is advertised to do. Field of view of this eyepiece is astounding. This is a must have eyepiece. First I bought the 10mm SWA 70* and for the price I really didn't expect too much!! But from what I can see through this Agena 70* EP, I can't see myself buying a standard 55* plossl anytime soon!! Since I bought the 10mm and seen the views of nebulas and planets, I went ahead and bought the other two to complete this set, the 20mm and the 15mm!! I am very pleased with the price; the glass has a purple multi-coating which looks cool!! The clear bolt case makes it easy to read the EP so you don't have to label the top or open each bolt case to find the EP of choice!!.. nice.. I would recommend this Agena 3 pc set of SWA 70* to anyone who is on a budget and wants a quality eyepiece and great views!! I'm 100% happy with mine!! First I bought the 10mm SWA 70* and for the price I really didn't expect too much!! But from what I can see through this Agena 70* ep, I can't see myself buying a standard 55* plossl anytime soon!! Since I bought the 10mm and seen the views of nebulas and planets, i went ahead and bought the other two to complete this set, the 20mm and the 15mm !! I am very pleased with the price; the glass has a purple multi-coating which looks cool!! The clear bolt case makes it easy to read the ep so you don't have to label the top or open each bolt case to find the ep of choice!!.. nice.. I would recommend this Agena 3 pc set of SWA 70* to anyone who is on a budget and wants a quality eyepiece and great views!! I'm 100% happy with mine! !